White-cheeked gibbons, also known as northern white-cheeked gibbons, white-cheeked crested gibbon are primates found in Southeast Asia. 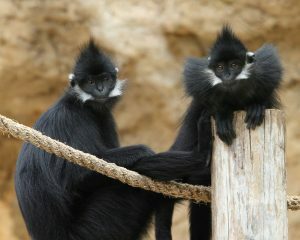 Their population is on a downward swing because of loss of habitat and persecution for food and traditional medicine. 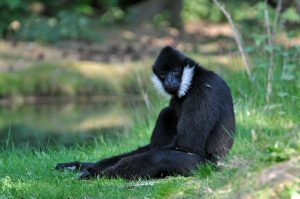 Size: White-cheeked gibbons reach a length of 17.7-24.8 in (45-63 cm). Weight: They weigh around 12.5 lb (5.7 kg) on average. Color: They exhibit sexual dimorphism in color. The babies are born with a cream-colored fur, which turns black with a white patch on the cheeks when they reach 2 years of age. 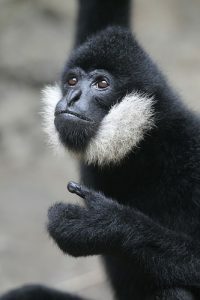 This further changes when they reach sexual maturity, wherein for the males the coat color stays the same while females revert to the original cream fur, with most of the white cheek patch becoming non-existent. They can be found in Vietnam and Laos. White-cheeked gibbons inhabit subtropical evergreen forests at elevations of 660-5,400 ft. 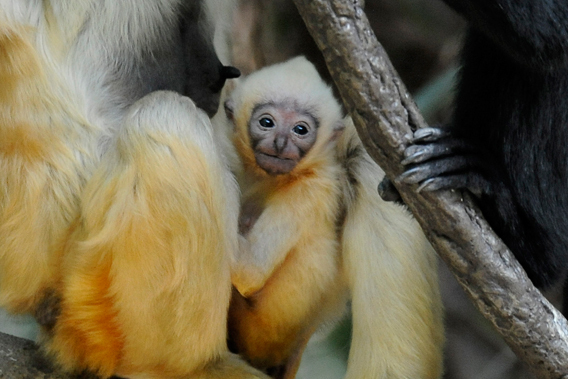 They have an arboreal lifestyle and live primarily in forest canopies. They live in social groups, usually consisting of an adult couple with their offspring. 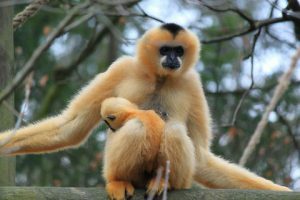 Hierarchy is led by the adult female, followed by her female and male offspring, respectively, with the adult male coming in last. Most of their days are spent in social grooming and playing with each other. They are diurnal, being most active during the day and sleep in the night on high branches, embracing each other tightly. They are territorial and mark their zones throughout the day with vocalizations. They are primarily frugivorous, spending most of their time in canopies foraging for food. Leaves, flowers, shoots, leaf buds and insects also form part of their diet. The menstrual cycle for female White-cheeked gibbons lasts for 28 days, although they mate throughout the year. After fertilization, the gestation period lasts for about 7 months, after which a single offspring is born. The baby clings to its mother from birth up to about 2 years of age after which it is weaned. Both the parents usually take care of the infant. The young becomes independent when they are 3 years old, and sexually mature at 6. They have an average lifespan of around 28 years in the wild. 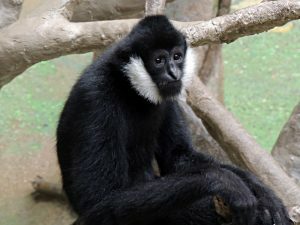 Both genders of white-cheeked gibbons partake in duet songs, wherein the female starts off a tune in an increasing pitch, followed by the male who joins in, and this lasts between 5 to 17 minutes. Sometimes both genders make similar calls, with the young of the group also joining in. Males can make booming calls because of their gular sacs. Being brachiators, their hands are specially adapted so that they don’t grasp the branches while swinging from one to another; instead, they form a loose hook around the branches which helps them in the swinging. Their hands are also long, and the arms elongated, further facilitating the swinging motion. Birds of prey like owls and eagles, as well as leopards, can prey on white-cheeked gibbons. However, because of their vigilance, swiftness in motion and arboreal lifestyle usually keeps the safe. 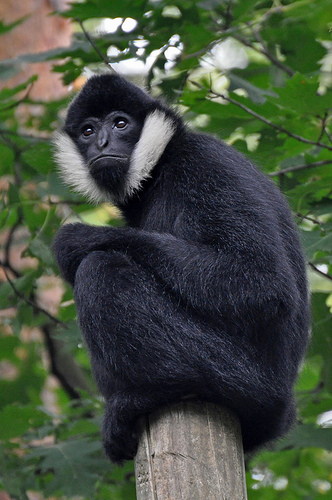 The IUCN considers the white-cheeked gibbon population as ‘Critically Endangered’. 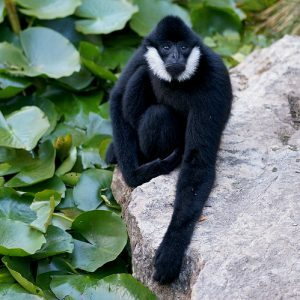 There is believed to be roughly 455 individuals who form a viable population of white-cheeked gibbons living near the border of Vietnam and Laos. 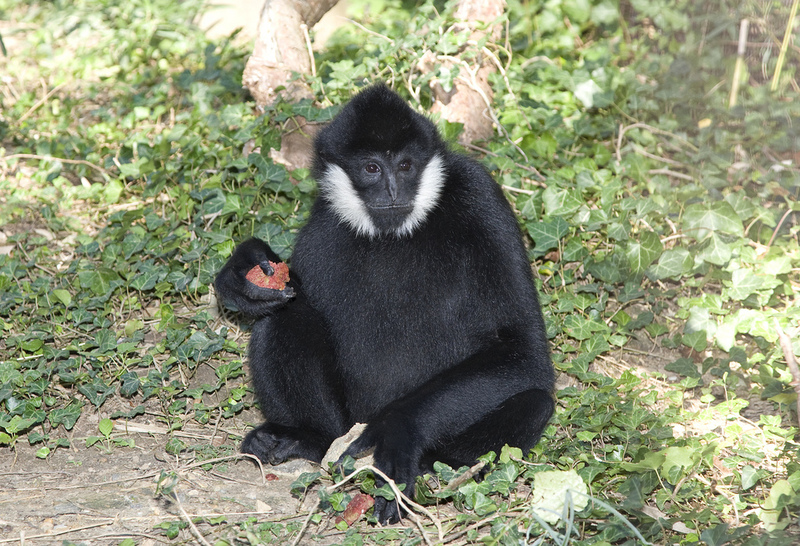 These primates perform an important ecosystem role where they help in seed dispersal across great distances.